The Miami Herald reports that the accident occurred at Shucker's Bar &amp; Grill as customers were watching the Miami Heat play the San Antonio Spurs. Authorities say an outdoor deck behind a popular Miami-area sports bar has collapsed during the NBA Finals, sending dozens of patrons into the shallow waters of Biscayne Bay and critically injuring three people. The Miami Herald reports that the accident occurred at Shucker's Bar & Grill as customers were watching the Miami Heat play the San Antonio Spurs. WSVN-TV reports that 24 people were injured, three critically. There were as many as 100 people on the deck at the time. 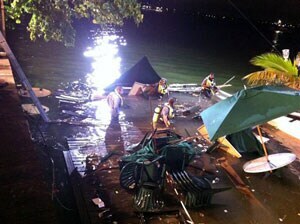 NBC6 reports that Miami-Dade Fire rescue divers are on the scene.